Home Criminal Jagoffs Once I Had A Railroad, Now It’s Gone……. Now one might say, “Hey, they’re probably doing it for the metal exchange rate!” Yeah, we get that but, our question is HOW…. as in how in theeeeeeee hell does someone steal a set of active railroad tracks? Hey, rail-burglars turn yourself in!!!!! As we offer to most stupid criminals, the writers of YaJagoff.com will represent you!! We have a plea bargain that not even Jim Ecker would think of. Now the ONE problem you “rail-roaders” DO have against ya is, what in THEEEEEEEE HELL do you do with 110-feet of railroad track now that this has made the news. Good luck hiding the rails under your mattress or in the garage next to your grandpap’s Lionel trains, YA JAGOFFS!!!! Thanks to Val Porter, WDVE for reporting this story!!! 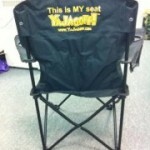 Don’t forget to order your “This is MY Chair, Ya Jagoff” chair for vacation!!! Click the pick below to order. Previous articleGet In The Fast Lane Grandma!!! Next articleKind Of A “PeterParker” and Kind Of Just A Plain Ol’ Jag… Well, YOU Know!